A Wikipedia Loves Libraries Editathon at the Smithsonian AA/PG Library, focusing on American Artists at the World’s Columbian Exposition. This event will include new editor training, an afternoon Editathon, and an evening happy hour. No experience necessary–technical or subject! 1:00pm-5:00pm on Friday, October 25, 2013, with a group happy hour at Capital City Brewery after. The American Art/Portrait Gallery branch of the Smithsonian Libraries is on the 2nd floor. Photo ID and pre-registration for the event are required. Wikimedia DC & the Smithsonian Institution. Contact me EvenhaugenA@si.edu or Diane Shaw at ShawD@si.edu with questions. The Editathon will focus on the American artists of the World’s Columbian Exposition. 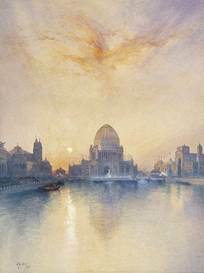 With approximately 1200 American artists participating in the 1893 World’s Fair in Chicago, it was the largest exhibition of American art ever assembled at the time. Many artists are well-known today—Thomas Eakins, Winslow Homer, Mary Cassatt, John Singer Sargent—but many do not have such recognizable names, much less quality Wikipedia articles. Please join us to mine library books, journals, curatorial files, Art & Artist Files, and all the online resources the Smithsonian Libraries can provide, to expand and improve information on great American artists at the Fair! Smithsonian Libraries Meetup & Editathon 2013 is part of Wikipedia Loves Libraries (WLL) 2013, the third annual continent-wide campaign to bring Wikipedians, librarians, and archivists together with on-site events. Running this fall throughout October and November, WLL coincides with the celebration of Open Access Week (THIS WEEK!) and American Archives Month.